I hope you all had a wonderful holiday, however and whatever you celebrate. Mine was quite lovely. Spent time with family and friends who are pretty much family. And I spent a good deal of time sewing, which has been fantastic! Here are some things I did. YUM. That's all I can say. I'm so proud of myself for seeing this through til the end! Now I just have to sew all those cat faces together into a super awesome little quilt that will hang on my wall. I can't have real cats because Mario is allergic, so I guess this will have to do! 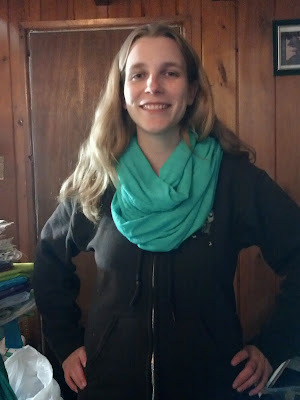 I also learned to make an infinity scarf! And finally, I finished my bee blocks for the month. Of course, I forgot to go to the post office today so they're going to be a little late... but hey. Holidays and finals. Right? And she's getting 2 instead of just 1 because my sugar and caffeine-addled brain thought 25 squares would yield me 25 HSTs. WRONG. Oh man, hot pink is hard to capture, huh? And the dying sunlight didn't help. No excuses, though. I just forgot to take pictures until twilight... Oops! Those cats are absolutely adorable! And they will shed much less than real ones. Love the colours and fabrics you chose for them! Great job on that scarf and your hst blocks, too! Oh man, your cats are awesome!! I stalled on mine (and I have no excuse :(), so I'm going to have to catch up! This bee block was definitely tricky, but not in a hard way, just in a "oops I'm dumb way"! It seemed to catch a few of us out for some reason! !